This chicken pot pie is baked to perfection with a biscuit topping. 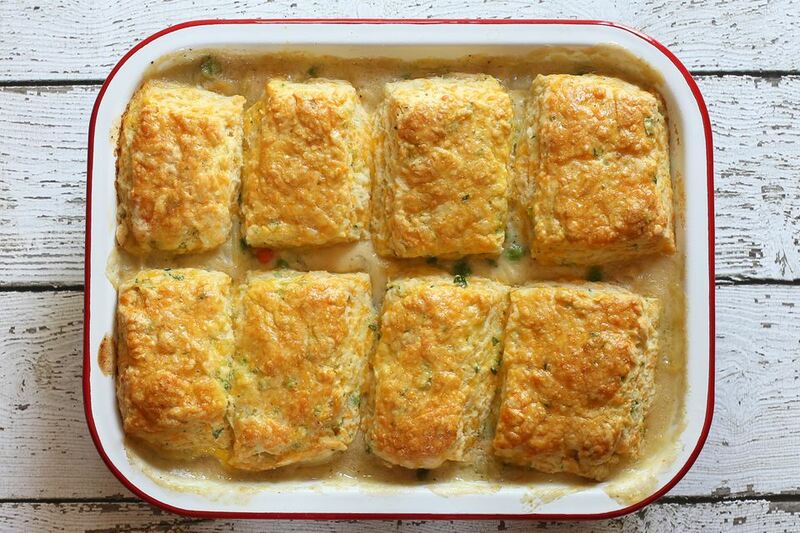 Instead of the usual pastry crust, this chicken pie is topped with savory cheese biscuits. The biscuit dough is rolled to a pan-size rectangle and the biscuits are cut into squares, so none of the dough is wasted. A pizza cutter makes it easy to cut the dough into uniform squares. If you prefer a neater effect or round biscuits, feel free use a biscuit cutter. For extra color and flavor, add some fresh chopped parsley to the biscuits. The egg wash gives the biscuits a nice shiny top. Sprinkle some poppy seeds or sesame seeds over the egg wash just before baking if you like. Put the diced carrots and potatoes in a small saucepan and cover with water. Place the pan over medium heat and bring to a boil. Cover and cook for about 10 minutes, or until the vegetables are tender. Drain and set aside. In a deep skillet or saute pan over medium heat, melt the 5 tablespoons of butter. Add the onions and celery and saute for about 2 minutes. Add the chicken pieces and continue cooking, stirring, until the chicken pieces are opaque. Add the 5 tablespoons of flour to the chicken mixture and cook, stirring, for 2 minutes. Add the chicken stock and thawed frozen peas. Cook, stirring, until thickened. Add the potatoes and carrots, thyme, salt, to taste, pepper, and heavy cream. Cook, stirring, for about 3 minutes longer. Pour the mixture into a 2-quart baking dish. In a food processor, combine the 2 cups of flour, baking powder, salt, and baking soda. Pulse to mix well. Add the pieces of chilled butter and pulse several times, or until the mixture resembles ​coarse meal. Pour the flour mixture into a large bowl and add the cheese, green onions, and cayenne, if using. Mix well. Add the buttermilk to the flour mixture and mix with your hands or a spoon just until the dough begins to hold together. Turn the dough out onto a lightly floured surface and knead a few times, just to combine. For the softest biscuits, take care not to overwork the dough. Pat the dough into a rectangle and cut out as desired using a knife, pizza cutter, or biscuit cutters. Place the biscuits on the chicken pie filling. Combine the egg yolk with 2 teaspoons of water; brush lightly over each biscuit. Bake in the preheated oven for 25 to 30 minutes, or until the biscuits are golden brown and the filling is bubbling.